Pilot plant studies provide the ultimate in assurance that a distillation column design will be successful. 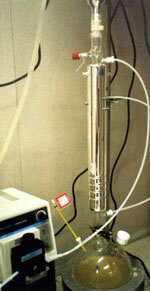 ERI provides laboratory and onsite testing of batch and continuous, simple, azeotropic and extractive distillation. We at ERI will be happy to discuss your distillation testing requirements. Engineering Resource, Inc., 19 Edgehill Road, P.O. Box 808, Winchester, MA 01890. Tel: 781-729-6777; Fax: 781-721-7445.